It is a rare scene to see a city bus stopping at the designated bus stop. The city of over 10 lakhs souls needs hundreds of Bus shelters but the city has only a few to count and the ones that exist are used by beggars and others to give themselves shelter. Traffic policemen can be rarely seen forcing the drivers to halt at bus terminals for which they are designated and built. A fantastic sentence written on every Japanese bus stop -Only buses stop here- not your time. But in our case the bus never stops at there is a bus shelter. The New bus stop at RPD with Cafeteria and wifi is useless if the buses dont stop at the stop and one can always see cars and bikes parked. The scene at Gogte circle is always of chaos as the City Bus and also the inter city bus drivers stop just after the turn near Desai Building stopping all the traffic coming from Congress road and Basveshwar Circle. The bus shelter is there about 25 mtrs away but these great drivers feel ashamed to stop at the Bus stop I guess. Today as well the city bus stops somewhat away from the circle but again not at the bus shelter and caused a traffic chaos and at the same time another city bus coming from the over bridge rammed into a car and damaged it. The police and the NWKRTC are never bothered to solve this basic issue even after years. There is CCTV cameras at Gogte circle have the police fined the bus drivers for this ? This is RPD corner where very recently a new bus shelter with cafeteria wifi was installed there and constructed under the MLA funds of Abhay Patil. But what is the use of that shelter when the buses don’t stop there. I have seen at least two cars parked at the stop always. I request the MLA to speak to the NWKRTC about this. Earlier as well we had posted similar incidents. True everybody as said what i feel. These driver are hopless atleast i have seen a driver who is on Belgaum to Kolhapur, this bugger simply applies the brake for the heck only for 3 seconds there are still people getting into the bus he moves leaving behind the passanger. There were lot of complains from the passangers and from his own colleagues. if somebody complains he gets rowdys to beat them. Dont Blame just the Bus druvers ! 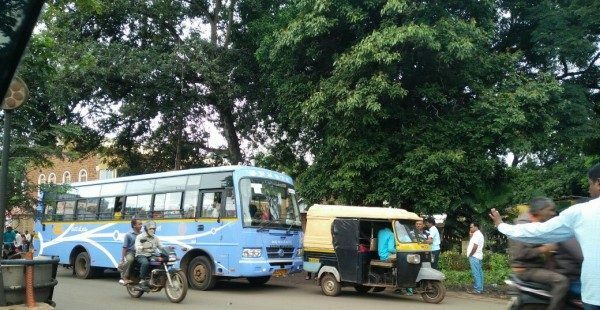 The auto’s of belgaum have taken over most of the bus stops. We all know that the auto drivers are the most powerfull and even an IAS or KPS designated in the city cannot bring them to discipline! Just spend sometime at Bogarves circle and it can be seen that its not the Heavy vehicles making a mess but the Autos , Minibusses and the City busses helping in making a mess of the traffic. There is another story for Shahu nagar passangers. The buses are never plied in time. The driver stops the bus at the last bus stop for 10 to 15 minutes, so that the autowallas have a chance to board the passangers. The autowalla charges only Rs.10 per passanger. While the bus charge is Rs.12 They load 5 to 6 passangers in a small auto an cooly makes 50 bucks for R C Circle. At KLE hospital main enterance gate is still worst, as the bus shelter is just a shelter covered all around with two wheelers parking. Let there be competition from private players, they will come at your gates to pick you up. Citizens should demand breaking up of the unions and allowing private players with good backing to run buses. What competition can do ? Just think of Jio. Not your regular tempo. If a private player with deep pockets comes and starts electric bus services. Then we enjoy better services. Strange. Something has happened to these KSRTC drivers now. They never stop at bus stops. In Rukmini Nagar city buses stop any where between Shri. Ayyappa Swami temple to middle of rukmini Nagar road. Commuters plight…only one has to experience it to explain. Plight of Sr citizens, children….my God……drivers cruality knows no bounds. We public dont use all the bus stands ,wherever we want stop bus.